Please email with part number and design wanted (see 'click on' link for designs) for a quote. Available in 'Hydrographic', please enquire with specific design style for price, also please see important notes in 'Hydrographic Designs' section at the top of the page. 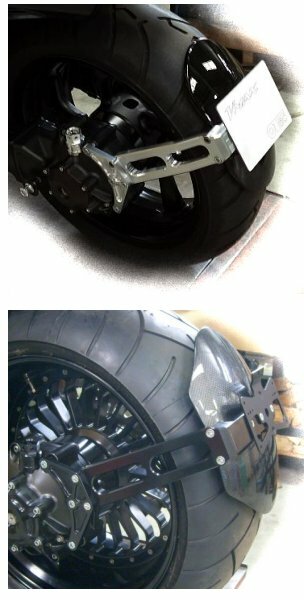 Please select what colour bracket, size tyre, which version of fender. Includes all necessary fitment kit, i.e. Indicators + taillight + license plate holder, supplied in unpainted. Includes all kit necessary to fit i.e. Indicators + taillight + license plate holder, supplied unpainted. Gives a cleaner look to the lower radiator area. Made in GRP / fibreglass, supplied ready to prepare and paint. 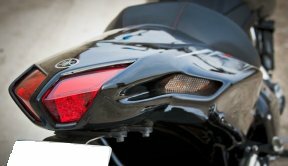 Note 1: Does not look like/match the Genuine Yamaha carbon fibre. 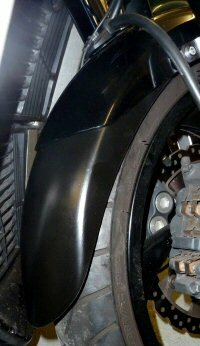 'RAM-AIR' Spoiler in GRP (Fibreglass), necessitates simple re-mounting of horn to behind Radiator. Yet another "NEW" design for the '09 V-Max by 'Exactrep'. 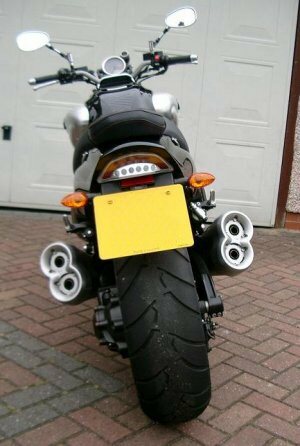 Sets the bike up with a forceful intimidating presence complimenting the original body style, whislt embelishing the 'hideously ugly' original upper headlight area though without obscuring light beam. Bolts simply to the original headlight mountings. 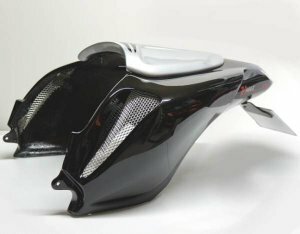 'Pillion Seat Infill' in 'Lustre Finish' Polished Aluminium. 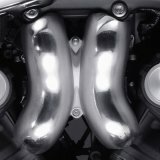 (to match original air-scoops), or High Polished. 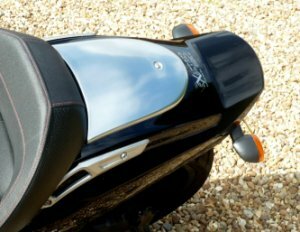 Remove original Pillion Seat, this moulding drops straight in and fixes to original mountings. Made in injection molded black plastic. 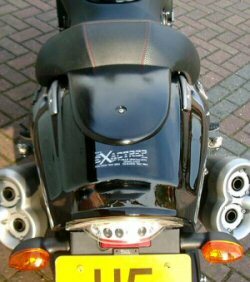 Satin Black powder coated Licence plate, + Indicator Bracket with supplied LED licence plate light with full instructions (using your original Red Reflector). 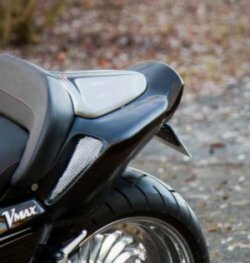 note: Supplied with Indicator mounting hole (8mm), however these could be opened out / 'Ovaled' to take original Indicator fitment. Made from G.R.P. fibreglass, supplied unpainted, ready to paint prep. Also, if you are interested in this part in Cast polished aluminium, please email. Polished Aluminium finished pair (1 x left hand/ 1 x right hand). Simple to fit! The black anodised aluminium meter cover. Note: Matches side cover set - Black pt.no:353B. 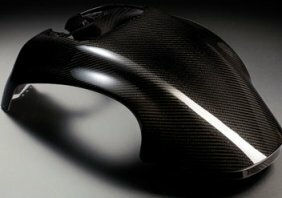 Carbon front fender, replaces the original fender. 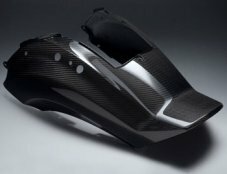 Note: Yes, at present, these carbon parts are definitely still available to order here in the U.K. 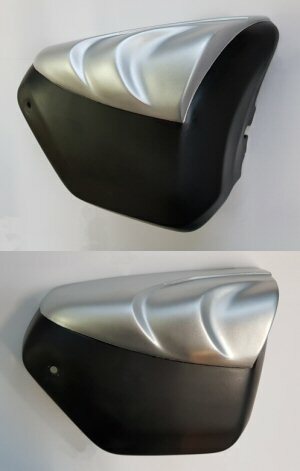 Carbon cover for the fueltank, replaces the original cover. 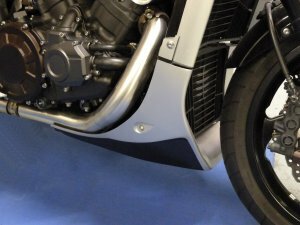 Carbon rear fender, replaces the original rear fender. 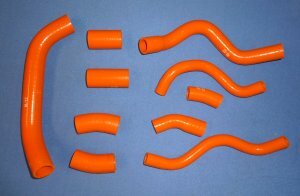 This is a 10 piece direct replacement silicone race specification coolant hose kit. 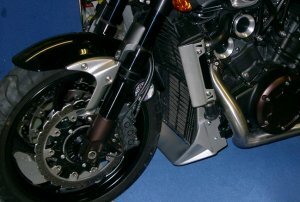 Great quality with ultra high burst rating and better heat dispersal make these an essential upgrade for any bike. Also great for custom show use. Available in Blue, Yellow, Orange, Green, Red and Dark Purple, all Gloss finish. 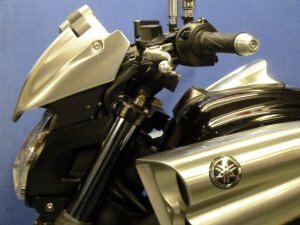 Stop tail light as original but with integrated indicators.